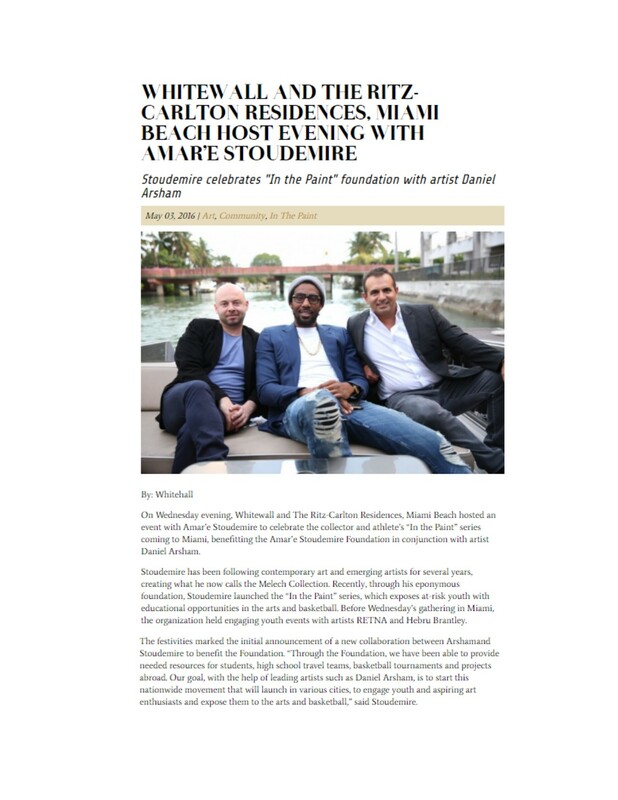 On Wednesday evening, Whitewall and The Ritz-Carlton Residences, Miami Beach hosted an event with Amar’e Stoudemire to celebrate the collector and athlete’s “In the Paint” series coming to Miami, benefitting the Amar’e Stoudemire Foundation in conjunction with artist Daniel Arsham. Stoudemire has been following contemporary art and emerging artists for several years, creating what he now calls the Melech Collection. Recently, through his eponymous foundation, Stoudemire launched the “In the Paint” series, which exposes at-risk youth with educational opportunities in the arts and basketball. Before Wednesday’s gathering in Miami, the organization held engaging youth events with artists RETNA and Hebru Brantley. The festivities marked the initial announcement of a new collaboration between Arshamand Stoudemire to benefit the Foundation. “Through the Foundation, we have been able to provide needed resources for students, high school travel teams, basketball tournaments and projects abroad. Our goal, with the help of leading artists such as Daniel Arsham, is to start this nationwide movement that will launch in various cities, to engage youth and aspiring art enthusiasts and expose them to the arts and basketball,” said Stoudemire. “Being a huge supporter of the arts, it’s great to see projects such as The Ritz-Carlton Residences, Miami Beach encourage more life enriching and art entertainment for residences. Having an art-studio on site that was advised by Tatiana Blanco who is here tonight leading our art installation, it’ll be another way for people to express themselves creatively,” said Stoudemire.